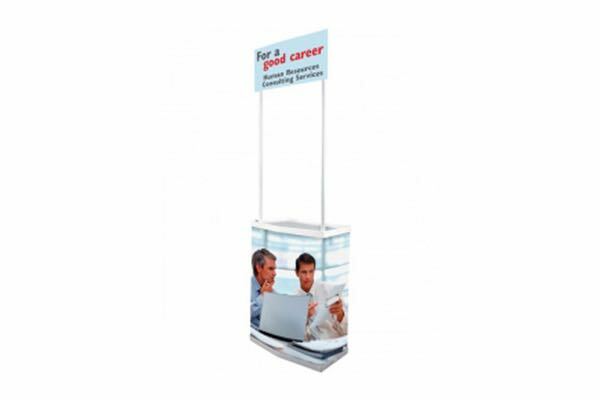 We supply a large range of promotional counters to meet with anyones budget. If you require a promotional counter please contact us at 01 4508057 or email info@signshopdublin.com. We will be more than happy to provide you with a promotional counter that meets your requirements. This simple and compact counter is suitable for exhibitions, demonstrations and other kinds of presentation. Produced in white plastic material, ready for any kind of decoration. Foldable and easy to transport and mount. Delivered with a shelf and bag. Price includes printed front graphic panel. 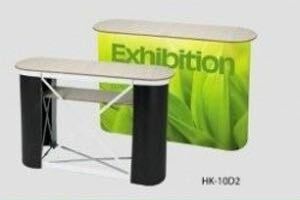 This simple counter is suitable for exhibition, demonstration and other kinds of presentation. Produced in white plastic material, ready for any kind of decoration. Foldable and easy to transport and mount. Delivered with carrybag. Powder coated steel pipes hold the 3mm thick PVC foam header panel. 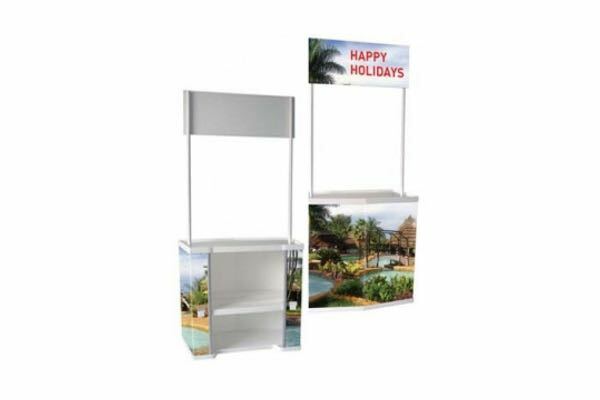 A very strong promotional counter unit very easy to assemble,compact and lightweight.Aluminium frame construction, top plate and shelf in wooden look. Profiles on the counter can easily be unassembled to allow a quick change of the panel. Black bag is included.